This fabled Dutch variety has enjoyed great success and is a favourite within the cannabis world. 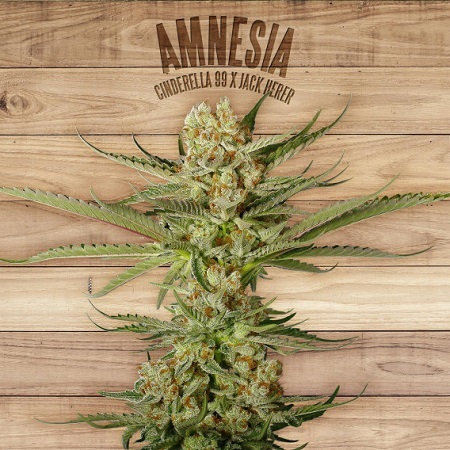 Amnesia Feminized Marijuana Seeds by The Plant Organic Seeds: This fabled Dutch variety has enjoyed great success and is a favourite within the cannabis world. Usually sold in many gene banks, this is the first time it is being sold from 100% organic crops. A vigorous structure that reaches quite a height; its lateral flowers are compact and as big as the central tail, therefore it requires garden stakes. It grows with strength and was selected because of its low flowering cycle. It is highly resilient to pests, which makes it ideal for beginner growers. Its flavour is citric and sweet, absolutely delicious! Its smell of incense is very particular, with notes of cedar and certain spices. The effect however is devastating, hence its name. Energetic and very creative but very powerful, so it is not suitable for new consumers. Its therapeutic properties are ideal for reducing nausea and stress despite its low content in CBD.